Californian authorities have prohibited SeaWorld from breeding animals in captivity, calling into question the future of the park's popular killer whale attraction. The ruling by the California Coastal Commission came after a request by the San Diego aquarium to build new tanks for its orcas. In a statement SeaWorld said it was "disappointed" with Thursday's ruling. SeaWorld plans to build two additional tanks for viewing and research. "Breeding is a natural, fundamental and important part of an animal's life and depriving a social animal of the right to reproduce is inhumane", said SeaWorld San Diego Park President John Reilly. The building project was approved "under a condition that would prohibit captive breeding, artificial insemination, and the sale, trade or transfer of any animal in captivity." The commission received more than 120,000 emails from people about the proposed expansion, mostly from those opposing the project, said commission spokeswoman Noaki Schwartz. The ruling affects SeaWorld's San Diego business, but not its locations in Florida or Texas. The People for the Ethical Treatment of Animals (Peta) praised the ruling, saying this would effectively end the orca whale exhibit. In a statement they said that it "ensures that no more orcas will be condemned to a nonlife of loneliness, deprivation and misery." SeaWorld has come under heavy criticism in recent years, particularly after the 2013 release of the documentary Blackfish which specifically criticized the company's orca programme. Blackfish claims that whales in captivity become bored in their sterile environment which makes them aggressive towards their human trainers. 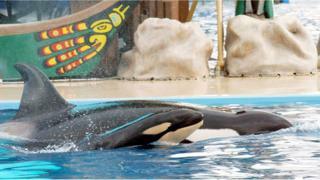 SeaWorld has called the film "false and misleading". Numerous celebrities have condemned SeaWorld's treatment of its captive animals in the past years. In August 2015, SeaWorld Entertainment reported an 84% drop in earnings in the second quarter of 2015, compared to the same period in 2014, and a 2% drop in visitor numbers.